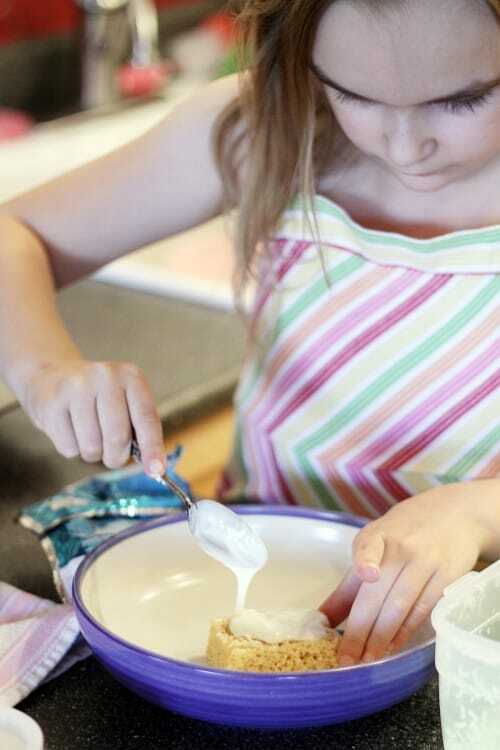 You could certainly make your own Rice Krispies treats, but I went with the pre-made version to keep this quick and simple. 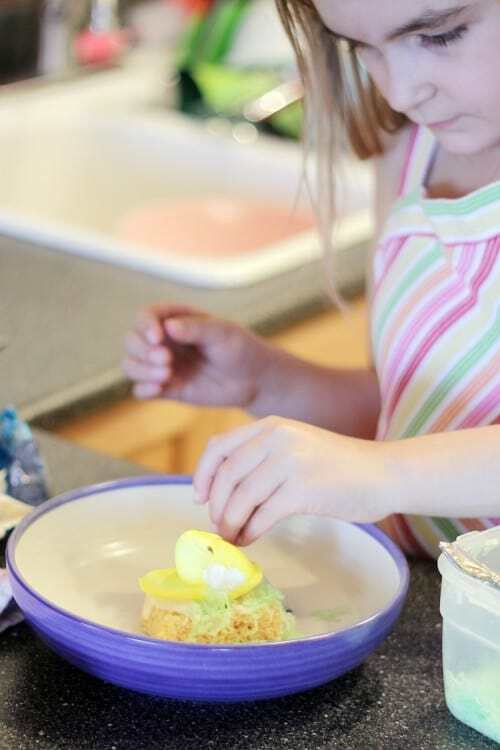 You’ll want to have Rice Krispies treats, melting chocolate, Peeps and then whatever you want to use to decorate with. We used a variety of sprinkles and coconut for ours. You can also use popsicle sticks or lollipop sticks if you like. 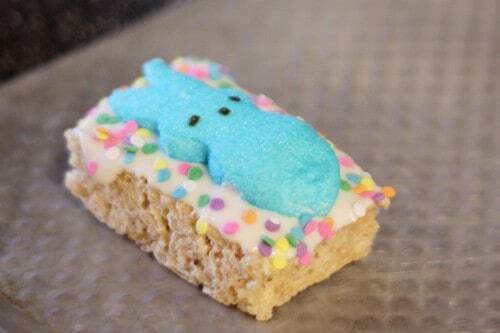 The first thing I did was cut my peeps in half. You certainly don’t have to do this, but I think it worked out well. 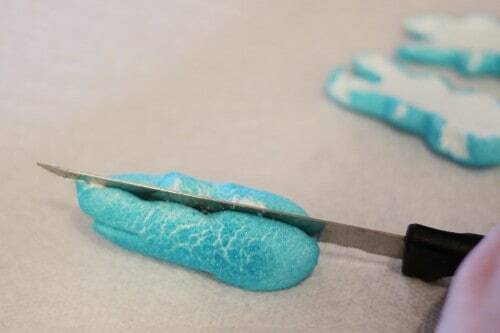 They do get a bit smooshed, but within a few minutes they sort of puff back up to their regular shape. 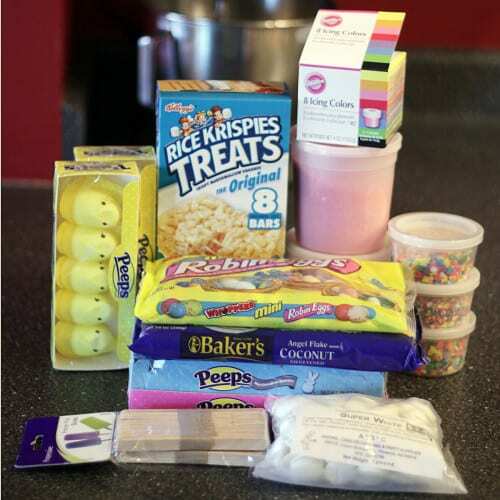 After you have your Peeps ready, prepare your melting chocolate according to the directions on your package. 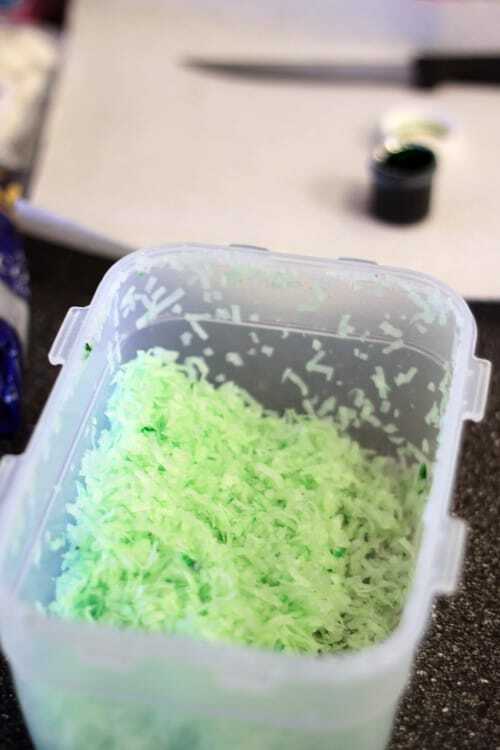 Also, if you would like to use some green coconut as grass, I found the best way to color my coconut was to put a bit of food coloring into a plastic container with my coconut and then shake well. 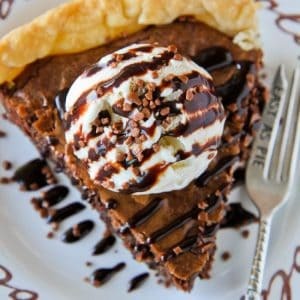 You will than spoon a coating of chocolate on top of your Rice Krispy treat. 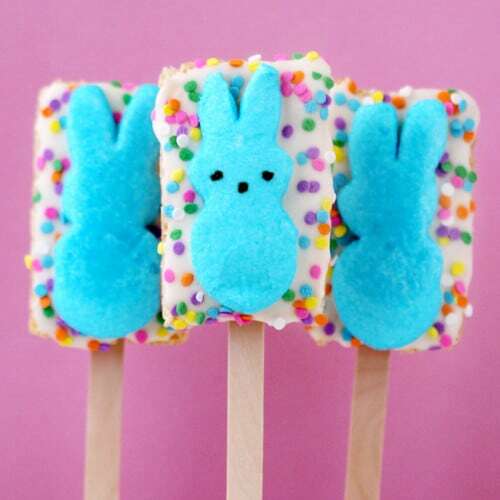 By adding a few sticks to your treats, you’ve created Peeps Rice Krispies Treat Pops. Love them! My daughter had a great time making these, and the whole project took less then 30 minutes. Such a cute idea and so kid friendly! 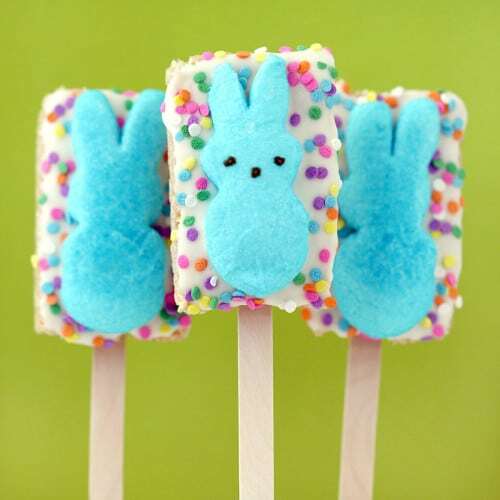 These would make the perfect Easter treat! What a fabulous idea for kids. LOVE IT!!!! These are SO cute! 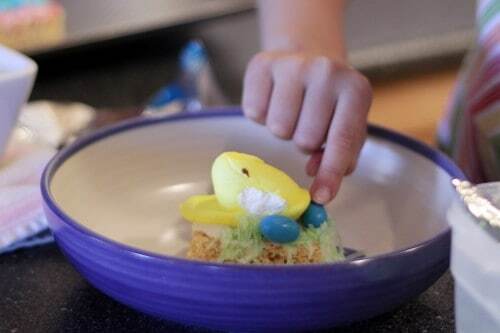 I remember getting peeps from my grandparents every year at Easter. To be honest, I hated the taste of them but I thought they were so pretty. Genius!!! I love it! 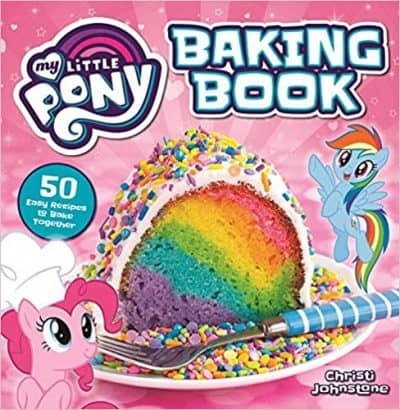 Think I’ll make some! And I’m a new follower!! How totally cute are those?!?!? 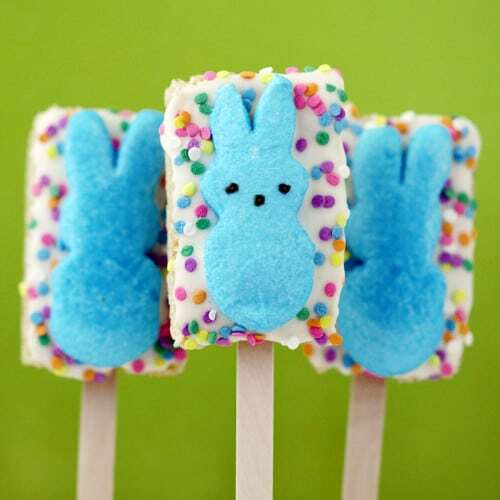 Those Peeps pops are such a great idea! They are adorable. these are a really cute idea!! 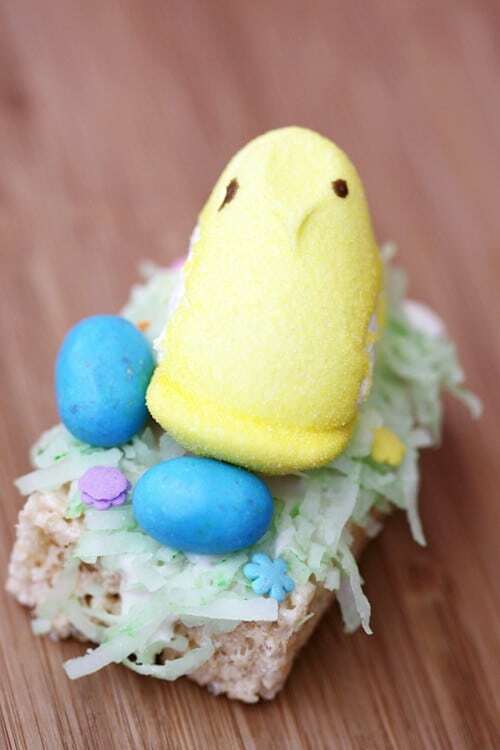 what a fun spin on the rice crispy treat…and anything with a Peep added on is instantly fantastic in my kids mind!!! Oh this is too funny!! 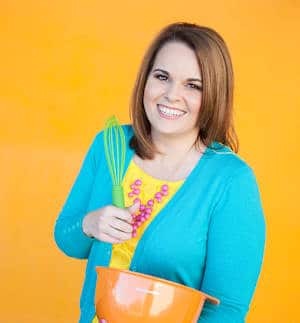 I just found your blog right now…and am scrolling through…I am mid-baking for my own Peep Week I am hosting next week! Great minds, huh? 🙂 I have up been up to my ears in peeps and I love them! I am featuring your peepstoday. Thanks so much for sharing. I know that all my readers are going to love them! They are too cute! So cute!! My kids would love those! 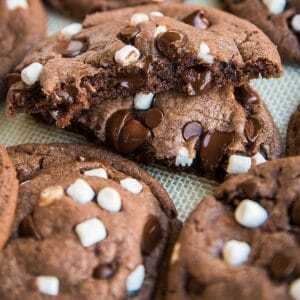 Oh my, I love these!!! SO cute! 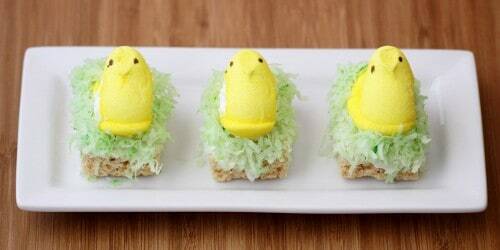 i <3 peeps! and love the creative stuff you did with them!!! 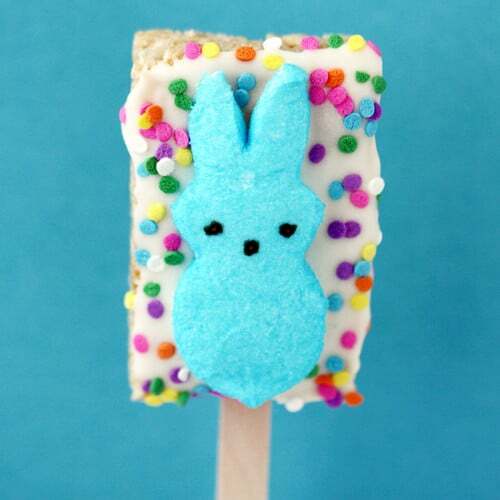 Loving this cute treat! 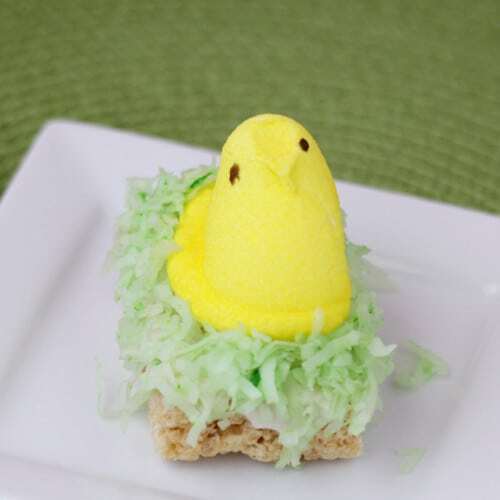 Just wondering, you say to melt the chocolate according to the package- are there directions on the back of the Peeps? 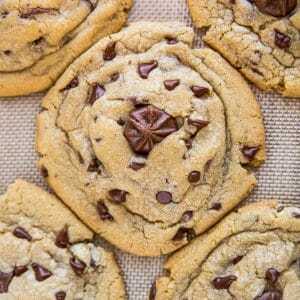 How much of each ingredient is used? Thanks! 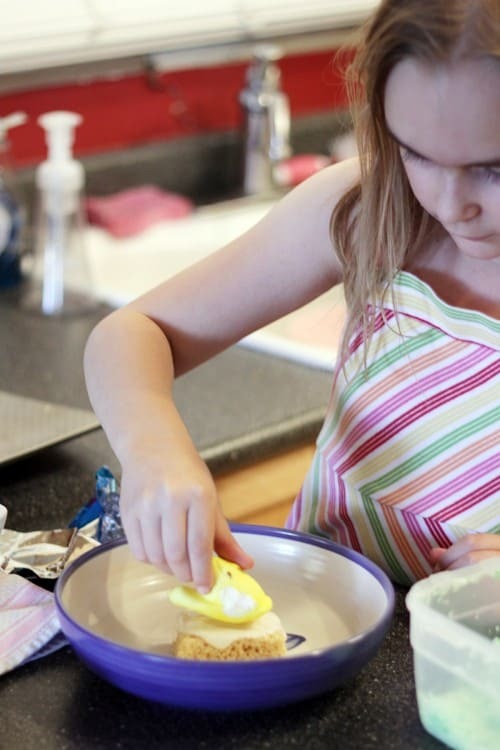 Caroline – there should be directions on the back of whichever melting chocolate you buy (not on the Peeps). 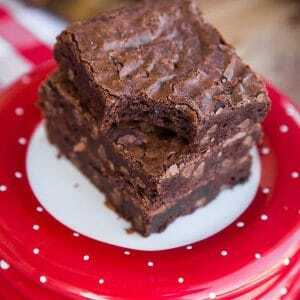 I like Wiltons, which can usually be easily found at Michaels, Hobby Lobby or Walmart, or there are a number of good bark type melting chocolates that are usually on the baking isle at the grocery store. As to amounts, I’m very unscientific – I just spoon on however much looks right. You can spoon a nice light coating on, or you can completely coat the krispy treat in chocolate, whatever you like the best. So cute! My son would love these! I’d love for you to link these up tomorrow night. Really cute! 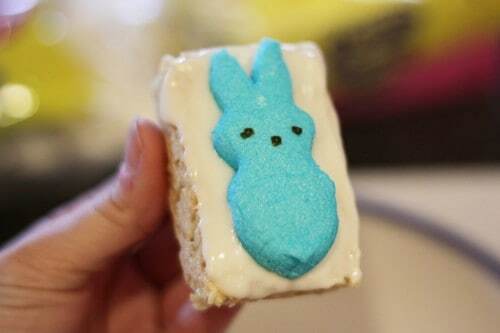 I just bought some Peeps for the first time EVER today. I will have to browse your ideas and pick my favorite. These are awesome! I love them…can’t wait to try them out with my kiddos! What a cute idea. Grandkids woulld love them. Thanks for the great idea. Wow, these are seriously CUTE!! I was just showing my son (now in his late teens) this blog post, wishing I would’ve thought up such creative things when he was little. He just laughed and said he wouldn’t mind now. He’ll even help me! So I guess I’ll be doing this neat peep goodie soon! This is way cute! Thanks for sharing. Thank you so much for the advice and the amazing pictures! My friends and I adore your site. Congrats on your TT&J feature!! 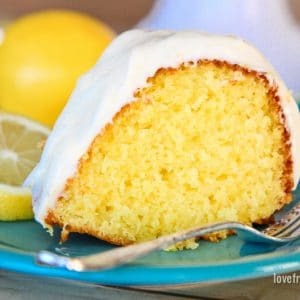 I was so excited to scroll down and see your cute Peeps Pops over there. I’m loving ALLLLLL your stuff, by the way. All. Of. It! Hi there! 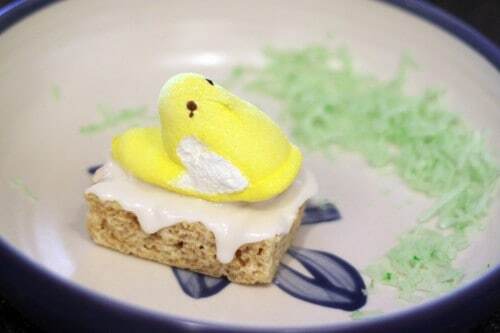 I love your peeps WEEK idea. We featured you on our blog! Check it out. This is such a wonderful idea!!! Im going to make these for my sons snack day this month 🙂 Thank You!!! These are just adorable!! 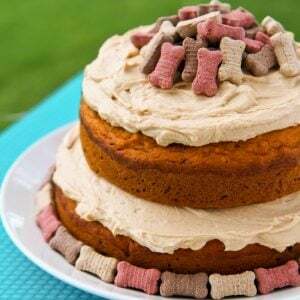 Two favorite treats in one!! How adorable!! These turned out so cute! 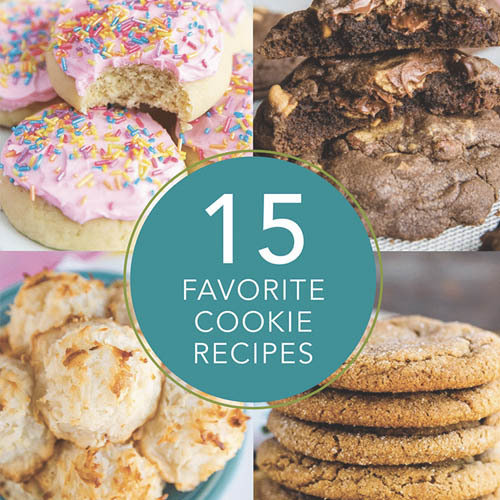 These are so cute, it looks like you had a great time making them too! These are absolutely adorable!! 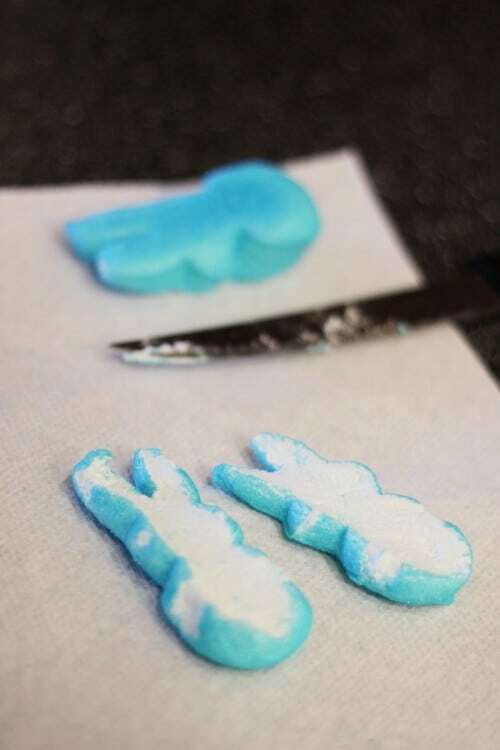 I’m making the ones on the sticks for my elementary class on Thursday… I know they are going to love them!! 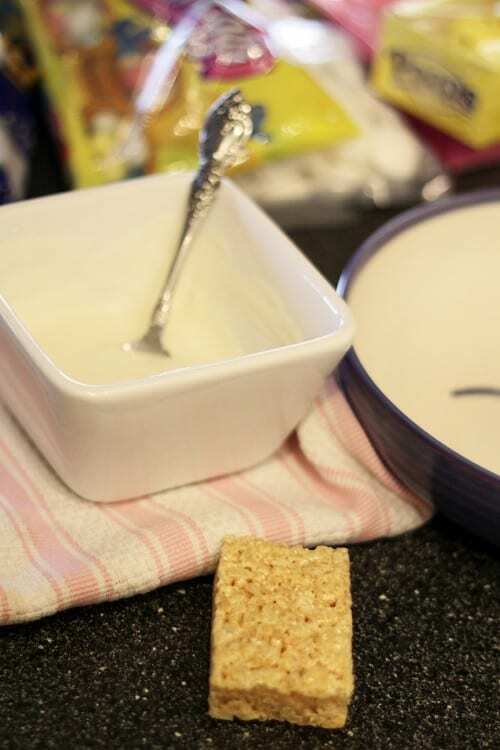 Just had a quick question… do you coat both sides of the rice krispie square with chocolate or just the one? Love it! We’re doing this in my house. Thanks!